83rd Street and Columbus Avenue, New York City. This photograph was taken in 1983. Looking over the above photograph of 83rd Street and Columbus Avenue in 1983, I wondered what the same street view looked like today. 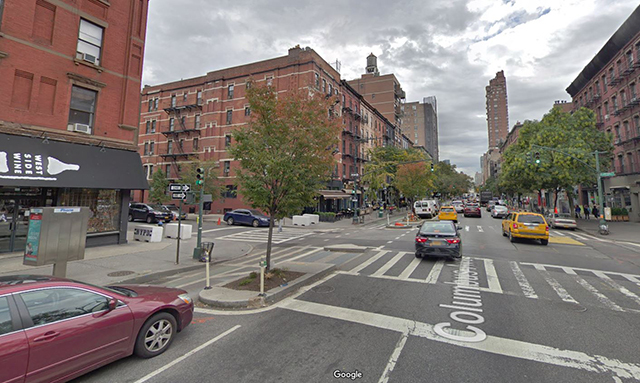 So I did a comparison of 83rd Street and Columbus Avenue from 1983 to 2018 using Google Street View. The more recent photograph is below. 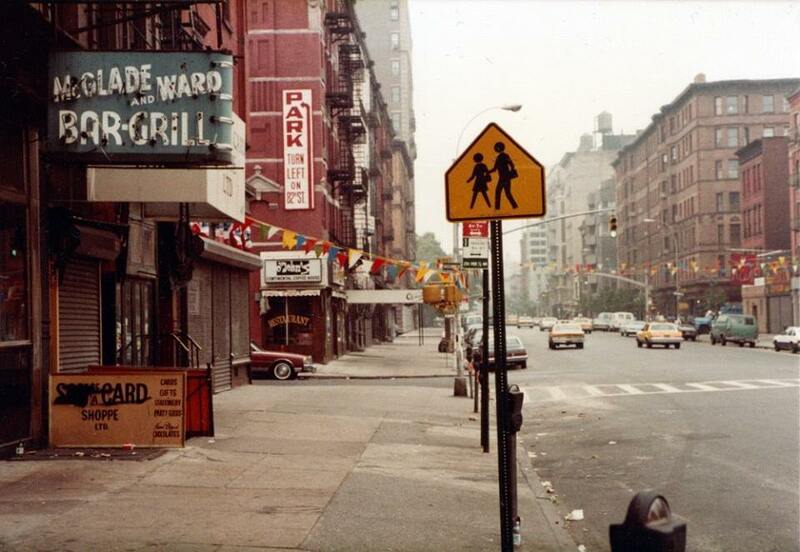 I previously did another review of 83rd Street a block over, at Broadway, from around the same time period. Another view of the McGlade and Ward Bar & Grill sign (courtesy of Liselight on Flickr). Notice the meat shop next door. The first thing that I notice is that the buildings haven't changed that much. Almost all of them are the same in 2018 as they were in 1983. The glaring exception is the apartment building in the distance, which towers over the building with the water tank which previously dominated the skyline. However, the red sandstone buildings on either side of Columbus Avenue appear virtually unchanged. 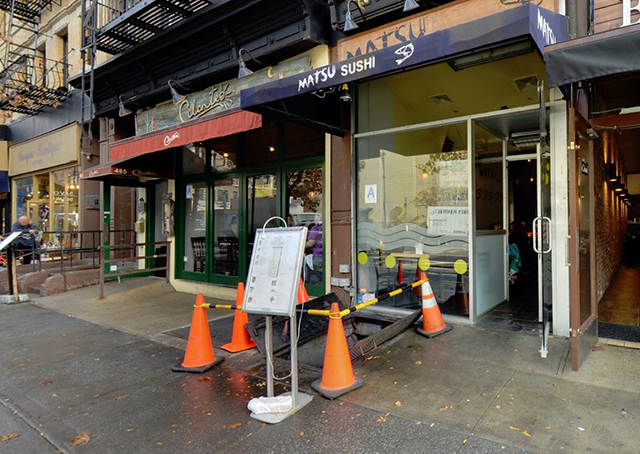 The stores along Columbus Avenue have changed. 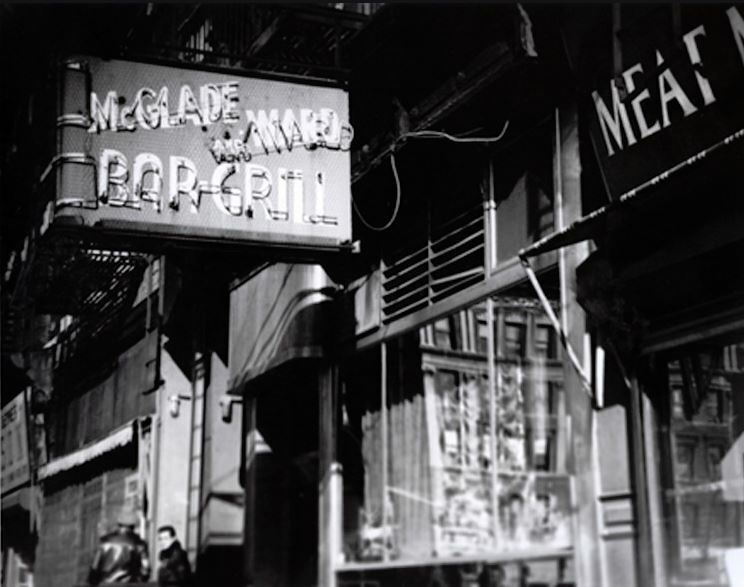 McGlade and Ward Bar and Grill at 485 Columbus Avenue was a pretty well-known tavern and may have been the reason this picture was taken in the first place. It moved uptown to 85th Street and then to Amsterdam Avenue under the name McGlade's Snug before finally closing. There was a butcher shop next door to McGlade and Ward's called Jerry's Meat Market. The close association of the two stores gave McGlade and Ward patrons some of the finest, freshest burgers in the city. You drinkers shouldn't despair, though, that corner still has a liquor store, called West Side Wine. The old McGlade's location still has a bar, too, as it is now home to the Cilantro restaurant chain's first location. One can see why it made a good bar, as it has fine wooden beams and flooring. One thing that is glaringly obvious from the photographs is the presence of trees in the more recent picture. If you ever start feeling wistful for the "old days," just bear in mind that some of the things we take for granted today were completely absent back in the '70s and '80s. The addition of trees here and in other places throughout Manhattan has made it a more liveable city. There is one noticeable absence in the more recent photograph, too. There are no parking meters in 2018 as there were in the '70s and '80s. Whether you view that as good or bad depends upon your point of view, as now you can't park at all along that stretch of Columbus Avenue. Go find a parking garage or hunt down the side streets. You may wonder why I am going on and on about a particular bar and grill that is long gone. Well, that may seem to be the small change of the grand scheme of things, but that small change is important in the daily lives of ordinary people. These sorts of places were more important back in the day before the Internet, social media, and cell phones. You actually developed a relationship with a place, knew the bartender, got interested in the owner's "story," and took your friends there. Now, of course, it is customary to grab a burger or something and take it home or on the run for the most part, whereas dining and imbibing was a more leisurely activity back in the day. There are a lot of people who miss specific places like McGlade & Ward's Bar & Grill. Thanks for visiting this offering in my series about "the more things change, the more they stay the same." 83rd Street and Columbus Avenue, New York City. This photograph is courtesy of Google Street View as of 2018 (Google Street View). That is one crazy little dog!